The 1936 Summer Olympics, officially known as the Games of the XI Olympiad, were held in Berlin, Germany. The games were thought to be successful. 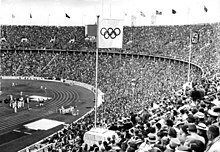 The costs of the games was mostly paid for by the German government. A total of 49 nations sent athletes to compete at the Berlin games. ↑ Sports Reference.com (SR/Olympics), "1936 Berlin Summer Games"; retrieved 2012-7-24. ↑ Zarnowski, C. Frank. "A Look at Olympic Costs," Citius, Altius, Fortius (US). Summer 1992, Vol. 1, Issue 1, pp. 21-22 [6-7 of 17 PDF]; retrieved 2012-7-24. ↑ Taking part in the games for the first time were Afghanistan, Bermuda, Bolivia, Costa Rica, Liechtenstein and Peru. This page was last changed on 15 October 2018, at 19:50.